Our cardboard lawn bag funnel for paper bags is this week’s product feature! As the remaining autumn leaves fall, it’s time for that final yard cleanup. Help make the job easier by using a leaf funnel to hold leaf bags open. Plastic leaf bag holders are also an option, but tend to be large and bulky to store. 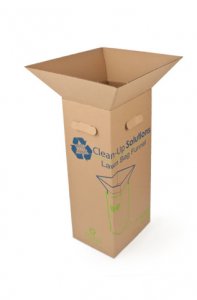 Made from 100% recycled corrugated cardboard, our sturdy, yard funnel is not only eco-friendly but can also be used season after season and collapses flat for space-saving storage. Yard waste bags can be difficult to fill, especially if you’re working alone. Many times as you struggle to transfer leaves and twigs into a bag, the bag will puncture or rip. Pratt’s corrugated, cardboard funnel bag holder, makes cleaning up yard waste quick and easy. Our two-piece, cardboard leaf bag holder easily assembles into a 32 ECT sturdy holder for standard 30-gallon paper yard bags. Measuring 15L x 11W x 35D assembled, it keeps the bag open and stable for disposing of grass clippings, leaves, pine needles, branches, twigs and other yard waste. At less than $2.50 each, this is an economical way to transfer raking piles and clippings to a bag for disposal. In preparation for winter, cut your lawn to optimal, short-cut height. Prune trees and trim hedges. Clean and polish your yard tools, so they’re ready to go for Spring. Air out the soil through aeration. Pick up the leaves to avoid suffocation of the turf and creation of a breeding ground for disease. Clean up beds and cover plantings with mulch or leaves.